The following is a transcription of an article in the August 29, 1912 edition of the Bedford, Iowa Times-Republican, which is an account of the July 29, 1912 ascent of Mount Rainier by Miss Isabel Fitts. Editors's Note: Isabel Fitts, now deceased, was the mother of William Fitts Asbury, the grandmother of Sarah Asbury Sherman, and the great-grandmother of Blair Sherman and Blake Sherman. F.E. 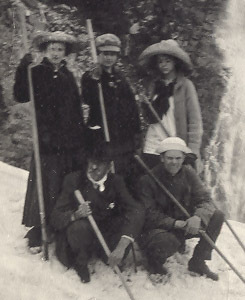 Walker of Bedford took his two granddaughters, Miss Ethel Combs and Miss Isabel Fitts of Seattle, Washington, on a trip to the Rainier National Park in western Washington, and Miss Fitts was the only girl in a party of sightseers to climb to the crater of Mount Rainier on July 29, 1912. The photo here shows F.E. Walker with Isabel Fitts in the background and Ethel Combs, her cousin, in the foreground. 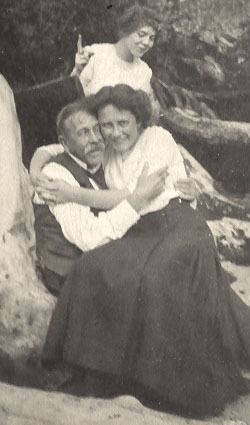 Miss Fitts made her successful ascent wearing a full-length skirt, and did it without the benefit of pitons, ropes, or ice clamps - she did it with nothing to assist her except for a sturdy walking stick. She was 18 years old. What a dull old world it would be if there were no mountains. Imagine looking over nothing but endless plains, year in and year out, with the prosaic sameness, the unattractiveness, and with little or nothing to create ones imagination. To a tourist visiting the Puget Sound country, which is surrounded so completely by mountains, there is always one particular peak, rising majestically from its brother sentinels, which never becomes dull, tiresome, or unalluring. There is a powerful fascination and a magnetism about this one peak, which is unspeakable. Mt. Rainier, the loftiest mountain in the United States proper, rises to an elevation of 14,526 feet and seems as "Monarch of all it surveys". It stands there in the sunlight, exposing its glacial radiance, mantled in the eternal snows of countless ages and sparkles as a bejeweled monarch, indeed, with the Cascade and Olympic ranges running in a zigzag course at its feet. It would seem, as one views this "thing of beauty", that a trip from Seattle on Puget Sound would be a matter of two or three hours. But one is, indeed, mistaken. In a direct line it is sixty miles but by the means of locomotion which has been constructed by man, the trip involves about 125 miles and takes from 7:20 AM until 6:30 PM to arrive at the place called Reese's Camp, or the Camp of the Clouds, an elevation of 5,557 feet and a spot not far distant from the glacier covered surface of America's most beautiful mountain. Let us begin at the beginning of this trip and see if realization is as great as the anticipation. The run from Seattle to Tacoma is through a rich valley land producing truck gardening and rich dairy products. Acre after acre of potatoes, cabbage, berries pass the eye in quick succession. After we leave Tacoma we find ourselves comfortably settled in an observation car so as not to miss one bit of this fairyland of nature's own making and the delights in store for us. For the first few miles we climb the sharp slope that leads inland from Puget Sound and traverse more of the fertile farming districts. Suddenly, with a slight change of grade, we plunge into the deep forest, with immense trees and heavy undergrowth lining the track. Here and there are seductive glimpses of chattering streams which sing the luring and rollicking song of the rod and line. There are numerous small towns which have industries characteristic of their surroundings. One can hear the busy saw and lumber mills at many of the short stops. At Electron we situated the immense power plant which turns the energy of the Puyallup river into running the entire street car system of Seattle and Tacoma. One is pleasantly surprised at a sudden turn which the train makes to look hundreds of feet below at the ruggen canyon of the Nisqually river which runs four miles through solid rock. We continue our course through these forests up a gradual incline until we come to Ashford, where we are alert and ready for anything in store for us. There are four large auto stages ready to conduct the party to the Rainier National Park and Longmire Springs. The road is fourteen miles long and is only a beginning of a host of new experiences and wonderful revelations of the glory and grandeur of this mountain region. It runs through forests with ferns and devil's club, with the bright red patches of elderberry, a pretty contrast against the deep green. At the park entrance we register, then continue until we reach Longmire Springs, which has, as the name suggests, mineral springs of iron, sulphur, and soda bubbling from the ground in various places. We were glad to have an hour's rest here before starting again upward, but punctually at 1:00 o'clock the four stage coaches, drawn by as many horses attached to each, stood ready at the inn and the real ride began. It is a ride over the best mountain highway in the world, eighteen miles in length. We start up and at every turn we are perceptibly higher. We wind through cedar, hemlock, fir, some of which grow to a height of over three hundred feet, some with a diameter of twelve feet. At the base of these majestic trees, from which live mosses hang, are dainty and lacey ferns, a very fairyland of verdure. We pass through green glades, walled and roofed in by masses of foliage; edge along the side of canyons where the road is level with the tree tops which rise from far depths below. Finally the stage stops and we need not be told to look at Berry Falls, as they dash wildly over the rocky surface. We ride a few paces farther and there in full view is the wonderful Nisqually, a glacier seven miles long, a mighty river with no perceptible motion. It, alone, is a sight of a lifetime. It is solid ice, imagine it, solid ice, and of a dark brown color, caused by the grounding of rocks for ages past. It is mammoth. The source of this huge ice field is far upon the mountain. From its lower edge a mighty river is formed and rushes wildly over rocks as if trying to secure its freedom, which it at last finds in the sea. But look! Does the stage go up that winding road, thousands of feet? We are at last satisfied that it does as we are carried up , up, up. What a view! It is superb! Thousands of feet below is the place from whence we came. The trees look as banks of verdure. The Nisqually river appears as nothing more than a thread. There are precipitous walls of rock overhead and under- neath. Words hardly express such a scene. One must really see and feel it. The wonders still increase. Around a bend in the road we approach a great silver forest. The trees have no foliage. They stretch their barren branches to the skies and resemble a winter scene. What a difference from the verdant greenness of the evergreens! We are prepared for such changes. We are right in the mountains. The peaks rise like druids on all sides of us. We cannot see the Monarch of all these lesser peaks, Rainier, because it is shrouded by a cloud. At every new bend in the road one sees or hears rumbling over the rocks, waterfalls, plunging cataracts, mountain streams. Narada Falls is beautiful. It has a sheer drop of 150 feet. Here we are told to alight and walk the remaining distance to the camp of the Clouds in Paradise Valley owing to the condition of the roads. There had been a heavy rainfall the night before. It is a delightful walk over a trail and one is glad of the chance to stretch a bit. We walk about a mile and a half through this entrancing scenery. Just look at the flowers! There are banks and banks of them! They dot every hillside and every valley! The red Indian paint brushes with their showy blossoms make a striking contrast to the avalanche lilies, with their snowy petals. The mountain heliotrope, with white flowers, the mountain heather, with its bells of red, white, pink, purple; the daisy, the purple astor, the rhododendron, cowslips, basket grass with their feathery seed pods, and varieties of flowers found in no other place, are a delight to the eye. In this region are two hundred and fifty varieties which bloom and die but are supplanted by new verdure. They are a pleasure to the botanist as well as those less versed in plant lore. At last come to patches of snow, snow in midsummer, which is a novelty to us westerners who see little of it. We at last arrive at Paradise Valley, an altitude of 5557 feet, a beautiful spot, dotted with dainty flowers and decked in symmetrical trees, not as tall, however, as those in the lower altitudes. The Camp of the Clouds is simply a group of about fifty tents, with one long tent in which to eat of a lavishly set table. The first of June of this year the snow was thirty feet deep, covering the ridge-poles of the tent structure. There is snow still near by and we enjoy many pleasant snowball battles. After dinner we look up. Behold! The cloud is lifting from the mountain. It rises higher and higher. One begins to realize the magnitude and rugged anatomy of this giant elevation. Its sides are covered with living glaciers, its bare rocks are impressive. At last it stands in all its glory. The sun is sinking low in the west. The scene changes. From a white its base takes on a bluish tint but the summit still catches the rays of the sun. The rose tint fades into violet and thence into blue. It is night and cold. The camp fires brighten up the blackness of night and makes a cheerful picture with a hundred and twenty- five or more people telling the experiences of the days climb to various places of interest. The valley is surrounded by mountains and waterfalls, glaciers and cataracts, streams and flowers. One may stay in camp and only look at them or hike and explore them. We preferred the latter course. One day was occupied in climbing to the highest peak in the Tatoosh range, an elevation of 6564 feet. One travels up hills and into valleys, past a pretty group of reflection lakes and almost straight up over rocks and snow, past dangerous places where one misstep would be fatal, and back again over the same course. The coasting over a four hundred yard snow field on the way back is a great deal of fun, especially for those who enjoy fast travelling. Another pleasant and short trip is the one to Sluiskin Falls, from which two large white glaciers, Paradise and Stevens, show up to good advantage. They are a wonderful sight as they sparkle in the sunlight. In the Rainier National Park the wild animals and feathered denizens are not plentiful. There is little of the large game near places frequented by man, but one may frequently encounter a ptarmigan, a speckled bird much like a grouse, which coyly tries to protect her young. One may be walking and become startled by a long, shrill whistle. It makes you think of the street urchin, who delights in making as much noise as possible. But instead of a raggedy boy, one sees a marmot, an animal larger than a woodchuck and the color of the rocks, scampering over the rough surfaces so as not to be molested. The chipmunks are numerous and dart across one's path at any moment. Why go to Switzerland to satisfy yourself in mountain scenery and climbing when Mount Rainier has all the Alpine wonders? A trip to the summit of this great white Monarch is hazardous as any mountain climbing in the universe. It is wearisome occupying nineteen hours hard labor over vast snow fields, glaciers, and rocks. The area of glacial surface is estimated at 52,000 acres, more than the Alps combined and from geographic authority is said to radiate more volume and ice area than any other one mountain in the world. It is thirty miles around the base of this collosal pile of snow. Those who make the trip to the summit feel amply repaid at the wonders which they can see but once in a lifetime. Only those who are sturdy and ambitious even start to make the summit, and some of them fall by the wayside, affected by the high altitude and the physical exertion of such excessive climbing. The party must be accompanied by an official guide, preferably the Swiss guide who has been on the mountain nineteen years and accompanied ninety-two parties to the summit, in all. We arise at midnight, that hour when city revelers are bethinking themselves that the oil is burning low, and started at 1:00 a.m. for the never-to-be-forgotten trip. The golden moon is shining in all is glory. Our party of sixteen walk up, up, up, over nothing but eternal snow for five miles, without even stopping, until we reach a place called Muir, 10,062 feet elevation. This is not a camp at all but a heap of rocks on which to rest before another strenuous pull. We notice that the trees have at last disappeared. They first become smaller. They are gnarled and twisted as if they had endeavored to escape the fury of the fierce blasts that sweep over the upper slopes. The trees dwindle to straggling bushes, and then the climber is on the bare rocks, polished and scarred by masses of snow and ice that have swept over them. It is five a.m. and in the east streaks of red are beginning to appear. The view from this spot is beautiful, superb. Imagine looking down and seeing the sun rise. The air is as clear as a bell. We looked down on the Tatoosh range which, in comparison, looked like nothing but ant hills. We look east and see the inland country of North Yakima, one hundred and ten miles distant. Mountain peaks in various places appear as veritable ghosts on vigil. We look up the mountain. It is rose pink in the pearly light. It changes to dazzling white, sparkling in the sunlight and another day is ushered in by rose fingered morn. None of our party had intended to come only this far, which is a great deal easier climbing than the remainder of the trip. It looked as though we were at the very foot of Gibraltar, a massive rock, 12000 feet high but "looks are deceiving" in such places. We climbed up and ever up, over huge glaciers, the guide cutting out steps from the solid ice. Our Alpenstocks were of great help, for one misstep and we might fall to an almost bottom- less crevasse and never be recovered. It took from 5 a.m. to nine to reach the base of Gibraltar over a precipitous trail wide enough for only one footstep. Here were tiny white flowers existing on mere handfuls of soil. We are told that they are the Swiss Eidleweiss. The sun was shining brightly and the rugged sides of Gibraltar rock displayed many liveried colors of red, green, and pink. It loomed up as a very guardian to the eternal snows of the glaciers. Here we had to blacken our faces so as not to blister from the penetrating reflected rays in the thin atmosphere. The trail along the huge rock is the easiest climbing but the most dangerous, withal, of the whole trip. Large icicles, some thirty feet in length and massive rocks, warmed by the sun, come crashing over the sides, and stops not for mere man who may chance to be beneath. Ropes are used along these rocky ledges so if one should slip the others may help to balance him. One then climbs almost straight up over ice again, regular honey- combs. We looked up, and there, glistening in the sunlight, was a solid ice wall from four to five hundred feet high. It was beautiful. The colors vied with those of a thousand rainbows. In this sheer wall of ice are wonderful ice caves, with hugh icicles hanging from their polished surfaces. From the top of Gibraltar rock the last long stretch begins, over still more snow. Despite the glaring sun the air is freezing cold and if one stood still long, it would not be comfortable. We climbed zigzag across a snowfield two and a quarter miles long, rising in almost a straight line. It was very long and tedious. A wind blowing about sixty miles an hour retarded our progress greatly. At last we reached the summit and actually saw the crater from which streams of lava, ages, ago, belched forth onto the sides of the mountain and into the valleys. It is a mammoth affair, much in the shape of a bowl, has a diameter of 1600 feet, and its basin is covered with snow. Around the edges and under the rim rock are steam caves from which sulphuric stream fumes still issue forth. People used to sleep inside the crater, but of late the trip is made so as not to make it necessary. We reached the summit at 3:00 p.m., and, as it was freezing, only remained about twenty-five minutes. We registered in two books, which are kept in a tin box. The descent was a great deal easier than the ascent but pre- caution must be taken and every step made with decision. We traversed the nine miles and arrived at camp a little after eight p.m. Imagine, if you can, walking steadily almost straight up, over seemingly endless snow fields with nothing to eat or drink for nineteen hours! Imagine the physical strain of such a trip! We traversed over eighteen hours of eternal snow. It was a sight of a lifetime. Volumes could be written about the crevasses, the fissures, the glaciers, the crater, alone. Some day there may arise a wizard of words who can describe it all, but as yet, he does not and has not lived. 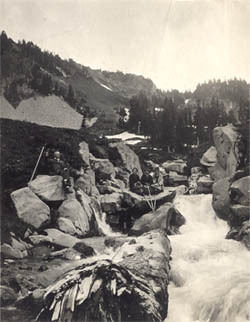 We remained at Camp of the Clouds three days after the summit trip, and then started homeward. The stage ride was much more enjoyable on the return. We were carried rapidly through that fairyland and every turn on the road gave us a panoramic view of some picturesque valley, thousands of feet below, with its tier upon tier of overgreens, until human eye could see no more. The Mount Rainier National Park, which was established by the act of March 2, 1899, has an area of 207,360 acres. Since the season opened, June 15, many thousand tourists have enjoyed its wonders and scenic grandeur. Tourists, visiting this Puget Sound country, should, by all means, take the trip at least to Paradise Valley. They would then feel that this article very inadequately conveys the beauty of a com- bination of Nature's handiwork, surpassing that in any part of the world. My good friend Bill Boulton, who happens to be the same age as my Father-In-Law, Bill Asbury, also summited Mount Rainier; here is an account of his ascent, which includes a link to some great photos of Mount Rainier; and also much more good reading from his memoirs. I will observe, however, that Bill did not make the climb in a skirt! Update: Sadly, Bill Boulton passed away in June, 2012 at the age of 89. Here is a link to Bill's Obituary.